, called the younger, to distinguish him from his grand-uncle the cardinal, was born, according to La Motte, in 1574, in the principality of Friuli, and studied at Padua, where he became so distinguished in early life, that Baillet has classed him among his “Enfants celebres par leurs etudes.” He afterwards studied law with equal reputation, and in his twenty-sixth year published his commentaries on the institutions of Caius. When he went to Rome, he was employed as secretary under cardinal Octavio Bandini, and discharged this office with great honour for almost 20 years. He was one of the first members of the Academy of Humourists, wrote a learned treatise in Italian on the device of the society, ftnd displayed his genius on many different subjects. Urban VIII. 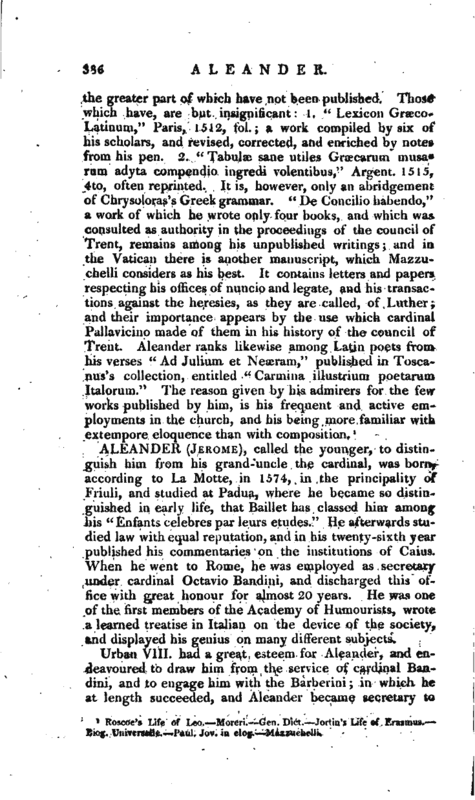 had a great esteem for Aleander, and endeavoured to draw him from the service of cardinal Bandini, and to engage him with the Barberini; in which he at length succeeded, and Aleander became secretary to | cardinal Francis Barberini. He accompanied him to Rome, when he went there in the character of legate a latere; and bore the fatigues of this long journey with great alacrity, notwithstanding his delicate constitution and infirm state of health. He did not escape so well from the luxuries of the table: for having entered into an agreement with some of his intimate friends, that they should treat one another by turns every three days, he indulged to an> excess on one of those occasions, which threw him into a disorder, of which he died, March 9, 1629. 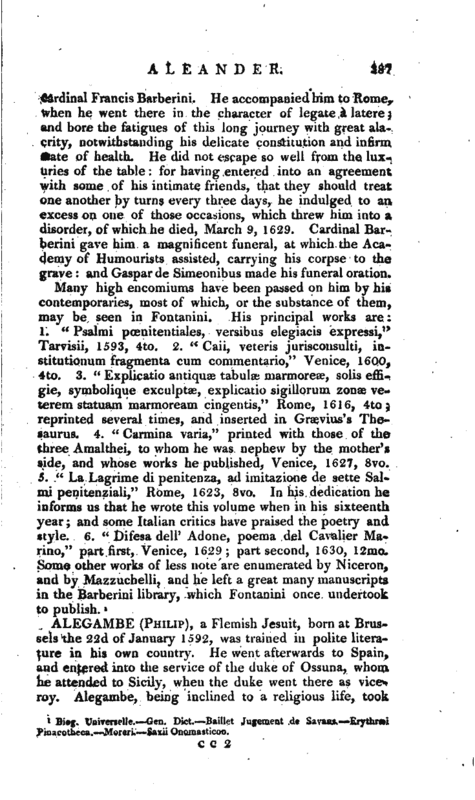 Cardinal Barberini gave him a magnificent funeral, at which the Academy of Humourists assisted, carrying his corpse to the grave: and Caspar de Simeonibus made his funeral oration. Biog. Universelle.—Gen. Dict.—Baillet Jugement de Savans.—Erythræi Pinacotheca.—Moreri.—Saxii Onomasticon.